Spiritual Compassion Session for Cancer Families will have its second installment this Wednesday at 7 p.m. Two weeks ago we viewed and discussed one person’s successful bout with leukemia. Come share your story with others who have, or are, seeking faith to discern God’s plan. An observance of +Reverend Father Sidney Sidor’s death is being held next Sunday, September 23. It’s the 40th day of the parish mourning his passing. The Divine Liturgy will be immediately followed by the Panachida memorial service as we continue to pray for our beloved deceased priest, spiritual director, instructor, mentor and friend. A meal served by the James J O’Brian council of the Knights of Columbus will be in St. Mary’s Hall. 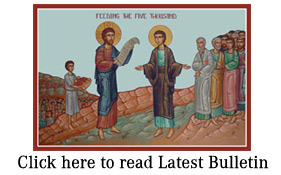 Please consider having a Divine Liturgy said for +Fr. Sid or his family. The traditional stipend is $10 per Liturgy. The next ancient Healing Service is scheduled for September 26th at 7 p.m. Will you or a loved one be the next recipient of God’s healing graces? Invite others to attend this wonderful prayer service. The Indiana Catholic Men’s Conference is scheduled for October 20. For more information visit www.indianacatholicmen.com or call 317-888-0873.